Thank you again for your continued support as a Model 3 reservation holder. In the past few months, we’ve made significant progress in production and have started delivering Model 3 to customers in over twenty states. As we work hard to meet demand, we wanted to let you know that your estimated delivery timing has been adjusted to a slightly later window. You can log into your Tesla Account to view your current delivery estimate at any time. Thank you for your patience. We can’t wait for you to get your Model 3. Here’s what Road & Track had to say about their first test drive. Kyle was set to get his Model 3 any day, since he previously owned a Tesla Model S, but the estimated delivery time was changed to “Late 2018.” Zach didn’t have a previous Tesla logged, so his estimated delivery time was previously a few months from now. 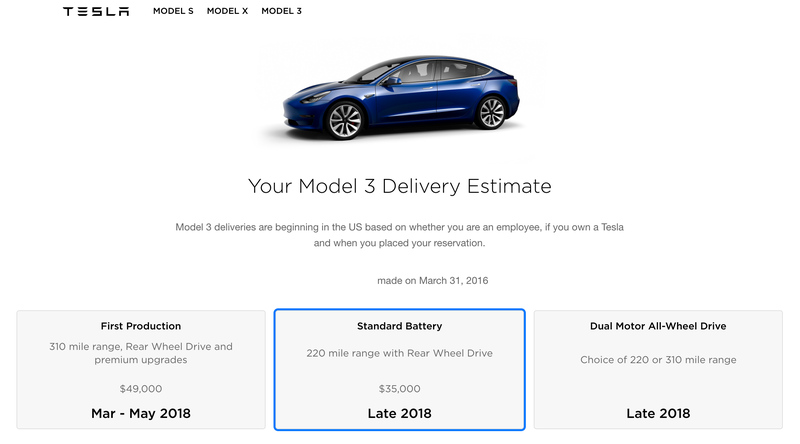 Both of them now have “Late 2018” showing as their estimated delivery time for a Standard Battery Model 3. For those of you waiting for a Model 3 with dual motors, Tesla is also estimating your car will now be available in “Late 2018.” It wasn’t that long ago that many expected the dual motor cars to begin rolling off the line this spring. In fact, last month, I was roundly booed by several CleanTechnica readers for suggesting that wasn’t going to happen. The Model 3 production delay has nothing to do with things at the factory in Fremont and everything to do with producing battery packs at the Gigafactory in Nevada. “There are four zones in module production. Module production is fundamentally the limiting factor on Model 3 output, which is ironic since battery modules really should be the thing we’re best at,” Musk said on the call last night. During a previous conference call in late 2017, we had similar news — the battery production line ran into problems. “We had to rewrite all of the software, from scratch. We managed to write 20 to 30 man-years of software in 4 weeks,” Musk said during the earnings call. Musk is good at heroic efforts to solve problems as they occur. He has spoken often of the “production hell” the company is going through as it tries to get Model 3 production up to expectations. But some might be so bold as to suggest such stumbling blocks should be expected. Musk is not the first person to try his hand at auto manufacturing. His management style seems to rely heavily on chaos and is more snafu than sanity. If you don’t know what snafu means, look it up. It now seems the Model 3 production ramp is going to be a reprise of the Model X fiasco — lots of bullish expectations and hype followed by months and months of delays and excuses. Elon Musk may resort to sleeping at the end of the production line again in an effort to convince nervous reservation holders that he is doing everything humanly possible to get things straightened out. But we have seen this act before. It’s beginning to wear thin on some of us. Is this further delay a big deal? After all, is it really that important whether you get your Model 3 in December instead of April? On an individual basis, maybe not. You are still in line to own one of the most transformative automobiles in history, a car that will rank right up there with the Ford Model T as one that redefines what a car should be. It will disrupt the industry and force other manufacturers to do a total rethink of the products they offer. What’s an extra 6 months (or so) when you get to be part of such a momentous cultural shift? The least expensive Model 3 is priced at $36,000 — including a mandatory $1,000 documentation fee. Back out $7,500 from that number and you have an all electric car with cutting-edge technology baked in for a little more than $28,500. If you live in California, your car could cost you $26,000 — barely more than a fully equipped Toyota Corolla and less than a Honda Accord. But here’s the kicker. By the time Tesla gets done pumping out higher priced, higher profit models, those “entry level” cars may no longer be eligible for the federal tax credit, which begins to phase out once Tesla sells 200,000 cars in the US. So, the car you thought was going to cost you $28,500 will cost $7,500 more. That’s a big chunk of change for a lot of people and may be enough to cause them to look elsewhere. Tesla started the electric car craze, but other manufacturers will be joining the party very soon. As critics points out, Tesla has been doing a highwire act for years now. Much of its ability to tap financial markets to raise the money it needs to keep operating is predicated on the lofty expectations it has created. “Look at us, Wall Street. We have more than 400,000 reservations for the Model 3!” And that’s cool, but what if a significant chunk of those reservation holders decide to beat feet down the street and buy from another company? What then? What if all the hot air goes out of the balloon? Many people think such an idea is ridiculous, but is it? Just last week, Tesla announced that it had raised more than $500 million by bundling its automobile leases and using them as security for bonds. Some say that was a brilliant move by Tesla. Others say it was a Hail Mary play designed to keep a company that is drowning in debt afloat a little while longer. The danger is, the longer it takes Tesla to finally bring those $35,000 cars to market, the more reservations it may lose, the longer it will go without getting the revenue in either case, and the closer it will be to the ragged edge of financial disaster. One of our commenters recently reminded us of Preston Tucker, another automotive superstar who flew too close to the Sun and saw his dreams dissolve. Could Musk be next? He’s definitely getting closer to the Sun. Perhaps the most important aspect of the new Model 3 production delay announcement is not the delay itself but the way Tesla chose to make it public. After enthralling the investment community with bold projections and sunny forecasts on the Q4 earnings call, it slipped what could be the most important news of the day in the back door, hoping no one would notice. If nothing else, that suggests a willingness to fudge the facts and borders on willful deception. To use an analogy from motor racing, until yesterday, Tesla seemed to have a clear track with nothing but green flags ahead. The curious timing of this latest announcement represents a caution flag, one that wise people might do well to heed.